I’ve read the series many times, but not for a while. In celebration of the release of the final book in the series, A Memory of Light, I’ve started on book seven and will read through to the end. I am a huge fan of not only The Wheel of Time but also Brandon Sanderson’s own fantasy work (such as The Way of Kings and the Mistborn series). Revisiting a series I’ve enjoyed as much and for as long as The Wheel of Time is a great experience: exciting and nostalgic at the same time. Rand al’Thor has a lot riding on his shoulders. As the Dragon Reborn, his destiny is tragic and complex: culminating in his probable death as well as either the end of the world or its salvation. As a male Aes Sedai: a man who can Channel, his fate is to be driven mad by the corrupting taint of the power he must use. And as a man trying to bring nations together in spite of their territorial and political differences to face a much greater common foe, his lot is to maneuver, negotiate and when necessary overwhelm them into compliance. In A Crown of Swords, Rand must unseat an extremely powerful servant of the Dark Lord who has seized control of a country. This is only one of many distinct plots evolving in a Crown of Swords. The Aes Sedai of the White Tower are broken into two opposing factions, and the question of a war between Aes Sedai is now not if, but when. A small delegation of Aes Sedai hasten to the city of Ebou Dar to find a long-lost artefact of great power that they hope may be able to restore the seasons to their natural course, bringing an end to the year-long summer that grips the land. The Aiel, a foreign people tied to the fate of the Dragon Reborn, have also fractured. Not all the Aiel can accept the change Rand al’Thor gives rise to, and while some choose to follow him, others are now wreaking havoc. It’s difficult to explain the scope of the Wheel of Time universe. There are well over a hundred main characters, and that’s not even taking into account the rich secondary cast. The sheer number of different agendas Jordan imbues within his characters is awe-inspiring. Every single person is angling for something specific, and their goals are constantly shifting to align or clash with others’. 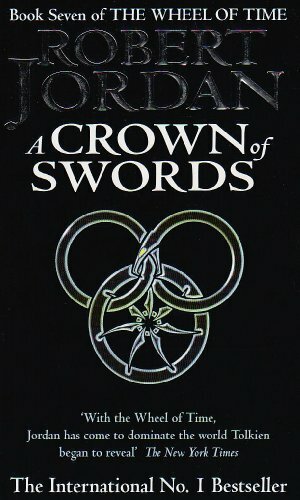 Jordan’s notes on the series encompass more than 37,000 pages, according to Brandon Sanderson. If you’re a fan of any sort of political machinations, then my goodness: this series will leave you gasping. If you love properly multi-faceted characters, who are selfish and altruistic by turns, looking to help their own ends and wondering how they can help or thwart others along the way, then the Wheel of Time could not be more perfect. If you adore truly elaborate plots that all must eventually converge either in a dove tail or a ball of flames, then Robert Jordan’s world is something you need to experience. I’m now nearly through volume eight: The Path of Daggers. I can’t wait to keep exploring the incredible world of the Wheel of Time! If you read fantasy, or are thinking about starting to read fantasy: you simply must read The Wheel of Time sequence.